Trecastagni has an interesting historical centre where the Head Church with its incredible Renaissance artworks overlook the village. 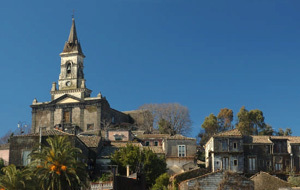 From the church it’s also possible to admire the beautiful view of the sea and also Taormina. 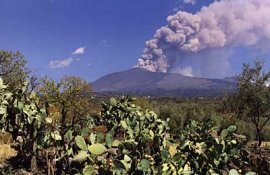 Of great interest is also the sanctuary dedicated to the martyrs Alfio, Filadelfo and Cirino to whom a very touching and suggestive festival is celebrated every year on the 10th of May with the participation of the pilgrims and a parade of the typical Sicilian carts. 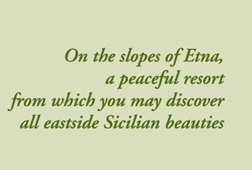 The sanctuary also boasts the richest collection of votive plates in all of Sicily. Fairly close to Trecastagni you will be able to visit: Acireale, a town on the sea with splendid Baroque buildings; Catania a very old city with marvelous baroque buildings too and a colorful fish market; and finally Taormina, where besides the breathtaking view you can also admire the ancient Greek Theatre. 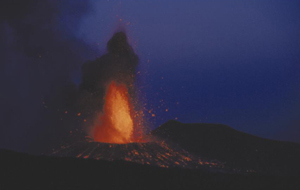 Mount Etna dominates all the territory and walking through its incredible lava slopes you feel as if you’re in another world. 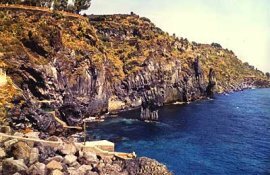 From the mountain with its 3000 meters of altitude you can easily reach the golden beaches of La Plaja in Catania, the pebbles of the beaches of Marina di Cottone or the black lava rocks between Acireale and Catania. The great Sicilian gastronomic tradition will offer gourmets the opportunity of trying delicious and unique specialities and as quick snacks, lots of different kinds of pastries, very nice ice-creams and sorbets (granite) with tasty croissants.